It has been a good week and gearing up to be a good month, too. I am still running every day, not drinking alcohol and I have cut down on cakes and pastries. And as a direct result of my mileage and increased effort, I have started to see a little drop in my weight. I don’t want to get too hung up on that but it is a good indication that things are heading in the right direction. The only downside to the week was that I still had jetlag as of Friday, and did not manage to get up once to do a run before work. On the plus side, that meant my evening runs were longer, but I was getting to bed later and finding it hard to get up the next morning. A vicious cycle. As a result, my HRV has started to decline. Nothing to worry about at the moment, just something that I need to keep an eye on to ensure that I do not overdo it. The highlight of the week was going out to Ome with Stan and running the course of the Ome 30km Race that I will participate in on 17th February. It is an iconic race that has been won by many of the greats, including Bill Rodgers, and I had hoped to run the 30km under 2:20. Now I am not so sure. I was happy to run 30km in under 2:30 for the first time in a long while. I am just not so sure that I will be able to take another 10 minutes off it in 3 weeks. I was totally wrecked on Monday morning after arriving back from Spain the day before. I just couldn’t get up and my HRV and Resting Heart Rate told me to take it easy. I knew that I would not be able to even think about doing yoga that night. I went off to work and struggled through the morning and early afternoon. Around about 3pm things started to pick up and when I was on my way home, I noticed the full moon and started to feel quite good. I quickly changed and headed out the door. To my surprise, I was in remarkably good form and I was positively flying, by my standards, and ended up doing the fastest run this year. Tuesday I was in bits. My HRV and my RHR were all over the place and I could not get out of bed. It was probably part the hard run that I did on Monday night and part the jetlag, but I was not in a good condition. I was not running in the morning and I had a couple of conference calls that night until about 7pm. After that, I suited up and went out for a very slow run down to Marukobashi. For the first time ever, my heart rate was under 130 for a run and my cadence was nothing more than a mere plod. Wednesday things started to feel a bit better. I still was not up to running in the morning but my HRV and RHR had turned a corner and I was not feeling as sluggish as I had been earlier in the week. I had a couple conference calls until 8:30pm and then hit the street, back down to Marukobashi. I ran the course 4 minutes faster than I had run it on Tuesday and my heart rate was back in the 140s. I was beginning to feel good again. On Thursday my calls did not finish again until after 8pm and as I was feeling tired, I decided to cut the run short with the hope of getting up early on Friday morning. I was pleased that my pace was improving and that my heart rate had not rocketed. On Friday evening I got out of work with no conference calls and headed straight for The Imperial Palace in Tokyo and ran 3 hard laps. I was very surprised that they went so well. My average pace for each of the laps was 4:42, 4:36 and 4:44. I am not used to running the palace that fast and normally my 3rd lap is much slower. After the run, I headed to Ginza for 90 minutes of Bikram Yoga. It was such a perfect evening. I got myself up early on Saturday morning and made it to Aoyama an hour before the Hill Repeats were due to start in order to do a warm up. I ran 3 laps of the Akasaka Palace, each one faster than the one before, 17:26 (5:11/km), 17:03 (5:06/km) and 16:44 (5:01/km). I had just enough time when I finished to get a coffee in the station convenience store before the Namban crew showed up and we were off again. I found the Hill Repeats very hard and I got dropped time and again. However, it is good training to do that workout on tired legs and I felt that I had achieved my goal for the day as I sat back in Starbucks afterwards and shot the breeze with Ashley and Emma. On my way home, a bought a ton of vegetables and made a giant daal that is going to keep me going in veggie world. On Sunday morning I woke after a fitful night’s sleep with a bizarre reading on my ithlete app. My Resting Heart Rate was down 9 beats from my usual reading to 47 bpm while my Heart Rate Variability had shot up 23 points to 101. I didn’t know what to think. Simon from ithlete was recommending taking things easy but I had already arranged to meet Stan at Kabe station at 8:17 (yes it is precise in Japan) and run the course for the Ome 30km race that we were planning on running next month. I decided to give it a shot and headed off before 7am. The weather forecast had predicted sub-zero temperatures but it was not that bad as we left the Ome City gym at 8:40. Stan had run this route many times and I had run it two or three times so we knew where we were going. The only difference was that Stan was in great condition. I follow him on Strava and for the previous 8 weeks, he had been running 160km a week at a pace that was less than 4:50/km. I told him at the start that he was welcome to run ahead of me and I would see it when the run was over. However, that would not be much fun, so we decided that we would stay together until the turn-around point of the race and each of us would run at our own pace back to the start i.e. Stan would run way faster than me and arrive back 15 minutes sooner. We started off slow and gradually hit our stride, running about 5:10/km with Stan in front. There were not that many runners out at that time and we felt that we had the road to ourselves. The course is undulating but gradually goes up. It was tough in places but I managed to hang on until we made it to the halfway point. At the Ome 30km Halfway Point. The sun was not cooperating with our photos. After we turned around the road did, in fact, go downhill and although Stan took off at a fast clip, my own pace improved as well and I moved up to 4:49/km. Suddenly there were many people running against us and the road took on a bit of a Sunday run atmosphere. My left leg, which had been sore on the way out, was now feeling much better and I enjoyed the run back to Kabe saying Konichiwa about 100 times. Although I was travelling this week, I did manage to get in a few good runs. The time difference of travelling East To West worked in my favour as I found myself wide awake at 4am waiting for the appropriate time to go running. Of course, there was no appropriate time as it was dark until after 8am but I like to fool myself. Stella from Colt had suggested some great running routes for me and I was glad I followed them. I also kept my running streak going throughout the trip, although this did require going out for a 2km run at 00:02 on Saturday morning as I had to get up at 3:30 for the flight back to Japan. But more about that later. I arrived at Barcelona Airport around 7pm on Sunday night. Being a Sunday night, the city was very quiet and the taxi made good time getting to the hotel. I did not run that night but ran each day over the next 5 days to ensure that I did not lose any fitness and that I saw a bit of the city as well. I was awake from 2am on Monday morning. As always there is nothing that can be done about jetlag unless you are prepared to take drugs. I just lay there waiting for the sun to come up. Around 5:30am I realized that the sun was not coming up and I went out for my run anyway. This involved a 2km run down to the beach and running back and forth for a bit. It was a mild morning and I saw several other people out running. They were all covered up with hats and scarfs so I guessed that they were locals not enjoying the mild Barcelona winter. After a couple of meetings in the morning, I slipped out in the afternoon to see Sagrada Familia. I had heard about it and seen some photos, but nothing prepared me for how great this cathedral is. If you ever get a chance to go, you must take it and also do the tour with the audio guide. The information you get is well worth the extra 12 bucks. On Tuesday morning my RHR and HRV were still holding up. I had expected them to dive with the jetlag but were much better than last month when I went to Ireland. Maybe it was the lack of alcohol or maybe it was the fact that travelling without my family is much less stressful. Either way, I was up and out on the street at 5:30am and heading to the beach again. I had been awake for a couple of hours and I felt wide awake. That might have been why I was able to push the pace a bit and I was very pleased with my effort. On Tuesday night we had a company dinner and on the way back Romain, Matt and myself decided to meet at 6am the next morning to run together. The problem was that I was still waking up before 4am so at 5:20, I popped out and did a fast 6km run near the hotel before the appointed time. The boys were a little surprised when I showed up at 6 profusely sweating. We then headed back for the beach and a fast run. Matt is a very fast runner but he kept the pace slow enough so that Romain and myself could keep up with him. On Wednesday night we changed hotels and our new hotel was right beside Montjuic, one of Stella’s running recommendations. I was feeling rather tired in the morning and I was very surprised that my Resting Heart Rate dropped 10 beats down to 47. I knew that I had to proceed with caution as I headed up the hill for Montjuic. I had actually wanted to go to the top but I got a little lost and ran around by the Olympic Stadium for a bit before heading back. I saw no other runners until the end of the run. Although I did not make my intended route, I had gathered enough information to be able to complete it on Friday morning. On Friday morning I met Romain again and we headed back up the hill. This time there was no losing my way and we made it all the way up to Montjuic Castle. It was still dark so we saw nothing but it was good to make it to the top. On Friday evening I had a free hour before the sun went down and I slipped out for a quick run before dinner. It was my first time running while it was light in Barcelona and I enjoyed it immensely. This time I ran up to the Olympic Stadium and completed 3 laps. There were a good few other people out running and lots of tourists. It was a great way to finish off the week. On Friday afternoon we heard that Taxi Drivers in Barcelona had started an indefinite strike. This would not have caused me much concern except for the fact that my flight was leaving at 6:55am and I needed to be at the airport before the subway and Airport Coach started. I thought about getting an Uber but the man at Reception at the hotel advised against it. He said that there had been cases reported of Taxis attacking Ubers near the airport. That was the last thing that I needed and I chose to leave the hotel at 3:45 and look for a regular bus. In order to continue my streak, I got up at midnight and ran up and down close to the hotel until I clocked up 2km and then went back to the hotel and to bed, before getting up again at 3:30 and finally leaving. Fortunately, I caught a bus at 3:55 am which dropped me off at Terminal 1 at 4:40 am, after driving all over Barcelona. But it only cost 2 euros so it was worth it. I arrived back at Haneda Airport at 6:30 am on Sunday and I was home within 2 hours. I did not sleep much on the plane so I was wrecked and headed to bed until almost 3:00 pm. This was reverse jetlag. Once you fixed your jetlag after travelling west, you have to do it all again after travelling east. After waking up in the afternoon I went out for a slow run to the Tamagawa River to keep my streak going and to try and feel better. I was more successful in the former than in the latter. A great man once said, “When you finish a marathon, that is the time to start training for your next race”. I am talking about you, Barry Bergman. And so it was that I finished the Ohtawara Marathon on Friday and started to focus on the Koga Hamanmomo Marathon on the 10th of March from Saturday. I don’t intend to run hard, or long, for a few weeks but writing this blog is a key part of my training so we are all going to have to put up with it for a while. Deal with it. I ran the Koga Hanamomo Marathon in 2015 (3:34) and 2016 (3:28) and really enjoyed it. It is flat and has lots of switchbacks, so you get to see your friends many times. Also, you get to train during the Japan winter which is the best time for running in Japan. My key training race will be the Ome 30km race on the 17th February 2019. This is an iconic race in Japan but I have never run it. Terri has rallied the troops from Namban Rengo for next February so it should be a good day out. After running Ohtwara the day before, my RHR and HRV were all over the place this morning, as expected. I took things very easy today. I slept until 10am, had breakfast, ran a very slow recovery run, had lunch and then went back to bed for 3 hours in the afternoon. I do not feel too injured but from experience, I get DOMS so it will be on Sunday when I find out how much damage has really been done. My HRV and RHR had recovered a lot on Sunday morning but I was still feeling quite sore, especially my right quad. Still, I was determined to keep my streak going and I headed down to the Tamagawa River again for an even slower run than Saturdayt. I had thought about running longer and being able to reach 300km for the month of November but gave up on that idea after the first few steps. It is good to finish the week with a run and my streak now stands at 57 days. Ohtawara Marathon – 5 days to go! It is fair to say that this week went much better than last week. I got over my cold, I ran 2 quality workouts and I continued my running streak to 50 days. I am now 5 days out from the 31st Ohtawara Matharon. I do not think that I will run it as fast as I did in 2012, 2015 or 2016, but I am a lot more confident than I was 2 months ago when the Matsumoto Marathon got cancelled. I am really just looking forward to getting out there and running my best race. Thank you all for reading. Next week’s blog will contain the race report, assuming a typhoon does not rip through Japan and wreck everything. After being sick for the previous week and only 11 days out from the Ohtawara Marathon, I wanted to go out and do my best to hold a fast pace for 10km. I was hoping that I could run 10km at 4:30/km pace and that that would give me some confidence. As it turns out, I couldn’t but I was not too far off. I jogged down to the river and completed a 3km warm up and was ready to start. All along the Tamagawa River, there are markers spaced 200m apart. I calculated that if I kept the time between markers at 54 seconds, then I would be able to maintain a 4:30/km pace. Of course, the first one went by too fast but after that, I fell into a rhythm and managed to keep them all in range until the turn-around point at 5km. The second half was much harder. I pushed as hard as I could but my pace began to slip and by the end of the run, I was running at 4:40/km. I was not too disappointed as I was getting over a cold and my average pace was 4:35/km. Tuesday morning I was still sore after Monday evening’s effort and just got up to do one lap around the neighbourhood to keep my streak going. My Heart Rate Variability had dived down by 16 points from Monday and all the advice was to take it easy. My pace was slow and my heart rate was low and I did not feel too bad. Tuesday evening I was back at Bikram Yoga for the first time in 15 days. It really is something that you have to keep doing and when you take a few weeks off, it is very hard to go back. All my friends had gone on Monday night so I was by myself. I managed to get through the class but during one of the rest periods I was forced to look in the mirror, literally. It was only then that I realized how much was being taken out of me by the class. Wednesday morning and my HRV was still crashing. Maybe the 10km Tempo on Monday was not the smartest thing to do returning from a cold. I decided to give Namban Rengo Track Intervals a miss and headed home after work for an easy 10km down the Tamagawa to Todoroki Stadium, home of Kawasaki Fontale. I felt fine during the run and managed to get to bed earlier than I had recently. Thursday morning and my HRV had made a return of sorts. I headed out before work and continued my streak with another easy 5km around the neighbourhood. I was beginning to feel better. Friday I woke early and managed to increase my regular run to 8km by doing 3 laps of the neighbourhood instead of 2. I was a little bit sore afterwards but happy that I had put that run behind me as I was hoping to go to Bikram Yoga that night. I finished all my calls at work by 6pm and got to the Bikram Yoga in time for the class. All my friends were already there and chilling out outside the room because it was too damn hot. Who would have thought? As it was my second class of the week, it went a little better than Tuesday and I did not look so decrepit in the mirror. Afterward, we headed to DevilCraft in Hamamatsucho for some choice craft beer and wonderful veggie pizza. You really cannot go wrong. I had another good run on Saturday morning. First I met Nick at the lockers in Aoyama Itchome station and we ran 4 laps around the Akasaka palace, each one a little bit faster than the last – 17:23/ 17:16/ 17:05/ 16:57. It was a great jaunt topped off with a couple of coffees courtesy of Nick in Starbucks. Afterwards, I headed back across the road and joined the Namban Rengo Hill Repeats from 10am. More than 22 people were out and we had a very enjoyable, although tough, set of hills around the same course. I managed some of them OK, but others were a complete disaster. Then it was back to Starbucks for more coffee and banter with these great people. My HRV was still looking reasonable on Sunday morning as I headed out for my last long run before the Ohtawara Marathon. I had planned to do 23km at a very easy pace in order to bring me up to 180km for the month on the 18th day. It may sound stupid, but I like to try and maintain 300km per month as much as possible and if I can keep a 10km per day average throughout the month, I know that I can do it. Halfway through my run, I crossed the bridge from Tokyo to Kawasaki near Noborito. I was greeted by 100s of white and black birds (don’t ask me to name them) here trashing about in the middle of the Tamagawa River. I guess that it was feeding time but it looked like they were having great fun. You can see a sample of the activity here. Ohtawara Marathon 2018 – 33 days to go! Another good week of training and now only 4 and a half weeks to my marathon. I managed 9 runs, 4 of which were quality for me. I met lots of friends, got in a Bikram Yoga class, helped my son with his school presentation, extended my runing streak to 22 days and covered 100km. If I can keep going like this for the next 4 weeks I will be able to give my best in Ohtawara. I woke up tired on Monday morning after my weekend of running but I was happy to see that my RHR and HRV were in good places. As I had to travel to Chiba for a 9am appointment, I only managed a short run in order to keep my streak going. If I was not trying to run every day in October, I never would have bothered. Still, it was good that I was able to keep my heart rate down, even if my cadence was very sluggish. After work, I went to my Bikram Yoga class in Ginza. I started the class last April and I have managed to go about once a week. It is very tough and I am brutal at it. I am particularly bad at anything that involves balance or squatting. Also, I am not so good at stretching. I do think that I am getting a little better at the Locust Pose. However, you will never know, unless you talk to one of the Nambanners who also go along with me. The hot room is difficult but not impossible. I try to get a mat near the door, which they open a few times in each class to let in cool air and give some respite. The main reason I am doing it is to avoid injury. For the past 2 years, I have suffered from pain in left hamstring and glute. It comes and goes, but when it is bad it really impacts me when I try to do anything above a slow jog. The jury is still out on whether the yoga is helping, but it does not seem to be hurting so I will continue to do it for now. Tuesday I had a bit more time and managed to get in my 5.3km run from 6am. I might have run further but I had to get back to get my son up by 6:30. I felt good on the run and managed to pick things up a little in the second half. I am pleased that I can now wake up at 5:30 every day. It is true what they say about habit. Once you do something for 3 days in a row, it becomes a habit and then it becomes easier to do each day. My morning routine is becoming, well, a routine. As soon as I wake up I sit on the side of the bed and take my RHR and HRV with my ithlete app. It takes about 2 minutes. I have been using this app for 5 years now and I feel that it really helps to point out when I am beginning to tire and need to rest. I then switch on my Headspace app and do 10 minutes of meditation. It is now a very popular app and I have been doing it for about 3 years now. It certainly helps to start the day on the right foot. I know it sounds that I spend my life monitoring myself on apps and I also use Sleepcycle, Myfitnesspal, Strava and Garminconnect, so maybe I am. Wednesday I woke to a great RHR and a great HRV. I felt that I had recovered well since the weekend and was for once looking forward to going back to the Namban Interval Workout. I made it to the Sento at Yoyogi Koen early enough to get a locker. As running has gotten more and more popular in Japan, it is hard to get a locket after 6:30pm. After a 5km warm up with my Namban friends, we headed over to Oda Field for the intervals. It was this first time that I had participated for several weeks. It was too hot for me to run intervals during the summer and I mainly ran in Yoyogi Park at an easy pace. I was a little interested in how I would get on. As it turned out, it was not brilliant but it was not terrible either. I managed to complete them and although I started to lose touch with the group from the 3rd interval on, I was able to recover in time before the next one. It was good to be back at the track and pushing my heart rate over 180 again. Thursday was a recovery run to keep my streak going. I was just glad to be able to get out of bed and run around the block a couple of times. I did feel sore after my efforts on Wednesday night but nothing that would stop me. I had a company event on Friday night so I knew that I would have to get out in the morning or else risk running late at night. It is tough to sleep properly after a late night run so I forced myself up and back around the block for 2 more laps. Saturday was a big day. Nick had called me on Friday and summoned me to partake in a Tempo Run on Saturday morning. His plan was to run 14km at 4:35 ~ 4:45 pace. We initially thought about doing the run along the Tamagawa River, but I wanted to go to the Namban Weekly Hill Repeats afterward, so we ended up going to Gaien in the center of Tokyo. I knew that it was going to be tough. Nick is in good shape and has been crushing one marathon after another. The Gaein is a 1.325km loop and we planned to run 10 ~ 11 laps to make the 14km. We set up our drinks and expected to grab them around the 5 or 6 lap mark. It was hard at the start. For me anyway. I was not sure of the pace and I needed to force myself. Nick was taking it all in his stride. I called out the 500m and 1000m timings and gradually realized that we were not losing any pace and that I might be able to hang on. Actually, our pace was increasing and we ran the laps in 6:11/ 6:19/ 6:12/ 6:08/ 6:10/ 6:07/ 6:08/ 6:04/ 6:10/ 6:10. We also did not need to stop to grab our drinks either and I was very please how the run went. Afterward, we headed to Starbucks for a quick coffee before the Hill Repeats started. With Nick at the start in Gaien. Almost 30 people turned up for the Namban Hill Repeats. There were so many people we were in danger of blocking the path at the Aoyama Itchome Police Box. Actually, we did block it and got shouted at a few times. I knew that I would not be in any great shape as I had already run that morning but I wanted to prove to myself that I could do two quality workouts in the same morning. I did manage to complete all 8 hills and that was good enough for me. We then headed back to the same Starbucks. The Namban Rengo Hill Repeats crowd in front of the Akasaka Palace. Sunday is Long Run day. Recently, I have felt that I have not done enough long runs and I wanted to make up for it. I also wanted to push myself over 100km for the week and get close to 300km for the month. My plan was to run easy for 40km and not push it too much. I was able to run at 6 min pace for most of the time and only stopped for drinks at 10km, 20km, 28km, 35km, and 38km. I ran all the way up from Mizonokuchi to Fuchu and back listening to Podcasts: The Daily, The NPR Politics Podcast, The Rich Roll Podcast, Serial and The Stand. You can catch up with a lot of stuff on a 4-hour run. It was a beautiful day with great views of Mt. Fuji. It is what makes the Tamagawa Run so special. Seats have been set up near Chofu for next week’s Fireworks. Ohtawara Marathon 2018 – 40 days to go! It’s been a hot summer. Here in Tokyo and everywhere else in the world. It really impacted my motivation to run for the past few months. While I was able to get out the door, it was very hard to do any quality runs and I found it tough. On top of the heat, Tokyo and Japan were hit by several storms and typhoons which made running seem unbearable. By the end of September, I felt I had had enough. 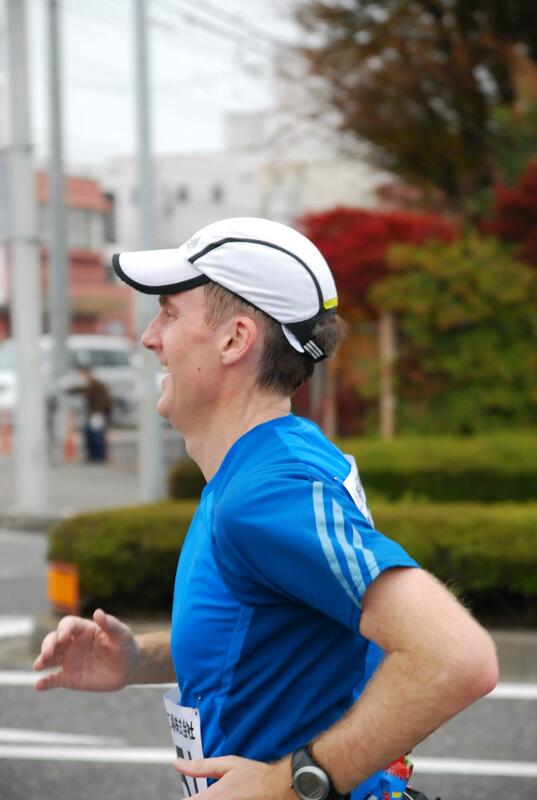 The only problem was that I was due to run the Matsumoto marathon on 30th September. I had run it last year and enjoyed it so I signed up again for the 2018 event. But my heart was not in it. I traveled up to Matsumoto on the Saturday with fellow Nambanner, Andrew. He had been training well with a new coach despite a hectic schedule and was clearly excited at the prospect of earning a new PB. With Andrew at Matsumoto Castle. He is clearly excited. I am carefully hiding the fact that I am not. That evening we met up with the rest of the Namban crew who had planned to run the marathon. We knew that there was a typhoon approaching Japan but it looked like it would pass through on Sunday night and that there would be no rain or strong winds on Sunday morning so we expected the race to go ahead. Therefore, it was a bit of shock at around 7:30 pm when Banno san told us that the race had been canceled. I felt that a life sentence had just been lifted. I knew that I was in no condition to run a marathon and the prospect of Andrew getting a PB and beating me in the process was very real. We did the only thing that we could do and ordered another round of drinks. Chika san enjoys a glass of wine after we find out. It was already too late to get a train back to Tokyo, and as we had paid for our hotels and checked in, we decided to make the most of it and go for a run in the morning before heading back. As it turns out, Sunday was a lovely day for running and we had a nice trot around Matsumoto while trying to find the best route on our iPhones and hardly ever getting lost. I felt sluggish and slow and it reaffirmed my feeling that this was not to be my day. Matsumoto Morning Run instead of running a marathon. On the train back to Tokyo, I was not in great form. I knew that I had dodged a bullet but also that I could not continue to do so forever unless I decided to give up entering races. I was lacking in motivation and willpower and needed something to jump start my engine – so to speak. My saving came in the form of an email from Richard. He described his own recent dissatisfaction with his running and how he planned to sort it out by going on a running streak. This would involve running at least 1 mile per day for the month of October, and then maybe longer. He invited anybody who was interested to join him. I thought to myself that that sounds like just what I need. Achievable. Goal Oriented. Group Related. Relative. Perhaps I have been on one too many Leadership Courses but I was sold on the idea. The next day, 1st Oct, I started and managed to complete the first week without too much stress by getting up 15 minutes earlier than normal and running the 2.8km loop around my house most days. The other thing that has gotten me motivated it again was this blog. I had expected to be writing my Matsumoto Marathon Race Report around this time, but as luck would have it, I never got to run the race. In previous years, I had written each week about my training for the Ohtawara marathon, but recently my enthusiasm had fallen off. It was a chance encounter with an old Namban friend, Arnaud, in Starbucks that made me want to write again. He was over from Singapore and having coffee with Jay when I bumped into him one lunchtime. He told me how he enjoyed my blog and how he was interested in how I fitted everything in with life and kids and work and running. It really got me thinking about how much I enjoyed writing it myself and how it motivated me to run. I decided there and then that I would restart it, at least until after the Ohtawara Marathon this November. So armed with my daily run and my weekly blog, I am going out to try and recapture all my motivation and run a good race in Ohtawara on 23rd November. At least, that is the plan. Monday was a National Holiday in Japan. Normally, I would try to take advantage of this and go out and do a long run. However, we had plans to go outlet shopping in Gotemba, so I sneaked out for a couple of laps of Mizonokuchi before we left. Had I not been on the running streak program, I would never have gone. I was happy with the run as I managed to keep my HR under 140 and get some points on the board at the start of the week. The outlet was not too packed and I got a nice pair of Nike Odyssey React for half price. These have turned out to be a great investment and I have worn them on almost every run since I bought them. I was pleased that my Resting Heart Rate and Heart Rate Variability were in the correct ranges. My average RHR is around 56 bpm so anything below that means that I am well rested. Likewise, any HRV above 90 is a good sign that I am not too stressed. I use the ithlete app first thing every morning to record these. I woke before 5:45 and was on the street by 6:03. I felt I could run a bit faster than Monday in my new Nike’s and my pace improved in the second half of the run. I was in good condition and enjoyed weaving through people on the pavement heading to work early. I managed a double on Wednesday. This time I was on the street at 5:55 to do my 2 laps of Mizonokuchi and I also managed to run in Yoyogi Park with Bob J on Wednesday night. I was very pleased with the morning run as I was able to push my pace a lot more again. It was no surprise that I was a little tired by the evening run and ran at much more relaxed pace. Bob had started early but stayed around to help me through my first 3 laps of Yoyogi Park. It was no surprise that I was tired again on Thursday morning since I got home late on Wednesday and did not get enough sleep. This was reflected in my RHR and HRV. I still managed to get up at 5:45 and plod around Mizonokuchi for 5km at an easy pace and low heart rate. I was just happy to get the run done. I had a meeting at work from 7 pm on Friday, so I knew that it would be challenging to get in a run after I got home at 9 pm. The plan was to get up again at 5:45 and do my usual 2 laps before work. However, I totally slept in and missed my run. That meant I was out on the streets at 9:20 pm running around the neighborhood to ensure that I got the run done when I should have been sleeping and getting ready for the long run in West Tokyo early on Saturday morning. This is when the streak gets tough but the challenge is all part of the fun. On the banks of the Akigawa River in West Tokyo. The plan for Saturday morning was to meet Namban running legend, Mark Feeley, at his home in Haijima and do a long hilly run around the Akigawa river. We both plan to do the 55km charity run with Knights In White Lycra (KIWL) in November in aid of Mirai no Mori and the Ohtawara Marathon is not exactly flat so we this run was the start of my preparations. It was great. Mark dragged me up and down lots of hills as we ran around his neighborhood greeting his neighbors. It is very enjoyable to be out of the city and running past rice fields and beehives while herons stood still in the river waiting to pounce on unsuspecting fish. The run was long and hard as I requested and afterwards, we retired to the local Ishikawa Brewery for some delicious craft beer. Saturday evening an old college friend, Alan, was in town for one night and we met up for some more craft beer in the Taproom in Nakameguro. I knew that I had another long run on Sunday and that Alan would probably be back in Tokyo in a few months, but the call of the Teikoku IPA was just too strong. Despite going drinking twice on Saturday, my RHR and HRV were still in a good range on Sunday morning. I was still tired from Saturday’s hilly long run so I decided that a nice easy run, trying to keep my heart rate well under 140, would be a good idea. I headed off to the Tamagawa, turned right and then down to Kawasaki. The temperature was cool and the run turned out well. My HR stayed under 140 until I was about 75% done. At around that point, I switched from the Rich Roll Podcast to Bob Dylan’s Blood On The Tracks and my heart rate started to creep up as I made my way home. All in all, a good week of running. I kept my streak going and I feel that I have gotten some of my motivation back. 40 days to the Ohtawara Marathon.